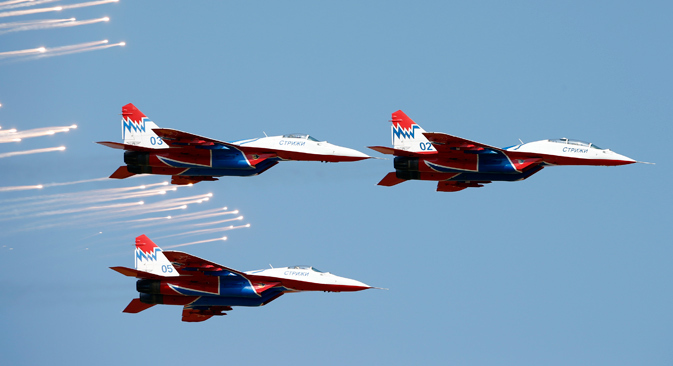 Since their inception in the late 1930s, MiG aircraft have become as synonymous with the Russian defense industry as the Kalashnikov assault rifle or classic tank designs like the T-55. MiGs have fought in numerous world conflicts from the 1950-1953 Korean War up to the current civil war in Syria, and came to symbolize Soviet military ingenuity and might. By the end of the 1930s, the Soviet air force had accumulated rich experience of air combat, its pilots having fought in Spain against the aces of the Luftwaffe, and in the border clashes with Japan in 1938-1939. Over this period Soviet experts familiarized themselves with the best examples of German aircraft, and it became evident that the days of slow-moving, low-flying aircraft were numbered: The future clearly belonged to new generation fighter planes that could fly at several hundred mph and at high altitudes. Since the Soviet Union still produced nothing like this, it was decided to take a Moscow aircraft factory as a basis for a new design office tasked with creating a fundamentally new aircraft. The bureau comprised experienced engineers and was headed up by engineer Artyom Mikoyan, with Mikhail Gurevich as his deputy. Both had previously worked in one of the leading Soviet design bureaus headed by Nikolai Polikarpov, and the core staff of the new entity was also drawn from there. Polikarpov and his team had already started to develop a new Soviet fighter with the working designation I-200. Mikoyan and Gurevich had to fuse all of the previous achievements, improve the aircraft’s existing layout and offer something radically different from anything currently produced by the Soviet military-industrial complex. They completed this formidable task in record time, and the resultant fighter plane took to the skies in April 1940, giving an impressive account of itself on its first mission. After some alterations in December 1940, the aircraft was put into production with a new name, the MiG, an acronym drawn from the first letters of the chief designers’ names. In a few months the MiG-1 was replaced by the MiG-3, an even faster model with a higher flight ceiling. In the early years of the Second World War it was the Soviets’ most advanced fighter and the most widespread among the new generation of aircraft: More than 3,000 MiG-3 aircraft came off the assembly lines in 1942. However, their production was virtually phased out that year since heavy battle losses meant that Soviet industry could not produce sufficient numbers of the MiG’s sophisticated engine. The Moscow manufacturing facilities had to be evacuated to the Volga city of Kuibyshev (now called Samara), but it was not possible to reproduce from scratch the entire complex production chain of the MiG – this happened only after the enterprise was later relocated back to Moscow. The Soviet designers were immediately presented with a new task: In the battles with the Luftwaffe it had become clear that the next step was the transition to jet engines that could significantly increase an aircraft’s speed. The engine’s creation was assigned to Mikoyan and Gurevich, and the resultant MiG-9 performed its maiden and pioneering flight for Soviet jet technology in 1946. One year later, the designers created a new jet fighter, the MiG-15, which was the first to fly at more than 1,000 km/h (over 620 mph). The MiG-15 was destined to become the most mass-produced jet in history, with 15,500 built over 10 years. Incredibly, the last of these was phased out of the Albanian air force only in 2006. In the 1950s, Mikoyan actively perfected this hit model. The MiG-17 and MiG-19 went on to break the sound barrier, and the latter model came close to reaching the 1,500 km/h mark. However, the real breakthroughs came over the next two decades, as the MiG-21 rolled off the assembly line to become the most mass-produced supersonic aircraft in history, distinguished by the characteristic triangular configuration of its wings. Over the years, more than 60 countries were to field the MiG-21. At the end of the 1960s, Soviet engineers devised plans for a new plane that could rival the latest U.S. aircraft. The older models were inferior to the U.S. designs in range and weaponry, but the MiG-29 eliminated this gap in the 1980s, with a design that could serve as a bomber with a payload of more than two tons, and was also able to carry nuclear warheads. But the MiG-29 remained a fighter plane too, capable of attaining an altitude of 18 km and accelerating to 2,400 km/h (1,500 mph), with a range of 1,400 km (870 miles). In Soviet times, the range of products of the MiG enterprises was extremely broad, up to and including the tentative MiG-105 project, a plane capable of launching air strikes from lower space. First conceived in the late 1960s, work on the “space plane” was periodically advanced in the 1970s in response to the U.S. shuttle program, but was finally canceled when the decision was made to proceed with the Soviet Buran space shuttle program instead. Today, the giant and illustrious company founded by Mikoyan and Gurevich is still regarded as a flagship of the Russian aircraft industry. Apart from serving in Moscow’s own armed forces, they operated for 70 years in the air forces of China, India, the countries of Eastern Europe and the former Soviet republics.